Connected health solutions expand the traditional means of practicing healthcare. Healthcare providers are using technologies to deliver more efficient care, provide better communications between doctors and patients, and enable innovative applications such as remote patient monitoring, disease diagnosis, and independent living solutions. Connected health services expand health care access for consumers living in rural areas and those living far from a required specialist. IP-based telehealth services have enabled video consultations for patient services ranging from basic health education to diagnosing strokes and evaluating the severity of skin burns. Connected health services fill a gap in care delivery and implementation. Connected health solutions can now provide periodic or continuous health monitoring of patients, from the comfort of a patient’s home. Remote monitoring can give physicians better insight into a patient’s care after he or she is released from the hospital, for instance. It can also provide daily monitoring of a patient who is struggling to manage a chronic health condition. Filling this health care gap can mitigate hospital readmission risks and catch worsening conditions at an early stage. This whitepaper focuses on the second scenario and evaluates the potential opportunities for broadband service providers in connected health products and service market. What is driving connected health market growth? The portion of the United States population aged 50 or above is growing rapidly. The aging of the baby-boomer generation brings with it certain challenges, particularly in the areas of health and wellness. There will be rising rates of chronic illnesses along with the desire of consumers to live safely and independently in their own home. These trends also create opportunities as this generation’s greater use of technology in healthcare makes this market ripe for telehealth solutions. The ultimate goals of health reform are to provide better access to care for consumers and to realize cost savings through new efficiencies. Current reforms in healthcare are promoting the coordinated care model to reach these goals. The two dominant models are the Patient-Centered Medical Home (PCMH) and Accountable Care Organization (ACO), and the number of patients enrolled in either a PCMH- or an ACO-recognized physician practice will experience a dramatic increase from 2012 to 2017. Over 3 million patients received care under a PCMH or ACO model in 2012, and this figure will exceed 130 million patients by 2017. PCMHs and ACOs will receive management fees to care for patients outside of traditional service settings and for their care coordination efforts. These fees will become new revenue sources for care providers. U.S. revenues from care management fees for these providers will jump from $156 million in 2012 to more than $8.8 billion in 2017. Use of connected health technology to manage patients with chronic conditions will also be much more common in a coordinated care model than it is today. Both care models rely heavily on technology to realize their potential in improved outcomes and cost savings. Care providers will invest in EMR technology and leverage general IT innovations such as cloud services, mobile computing, and data analytics in order to realize the cost savings and improve outcomes promised by these approaches. Healthcare organizations are evaluating technologies and potential partnerships to reach these ends. In many instances, service providers make the ideal partners as they have the expertise to deliver the reliable connections necessary to ensure the success of these solutions. 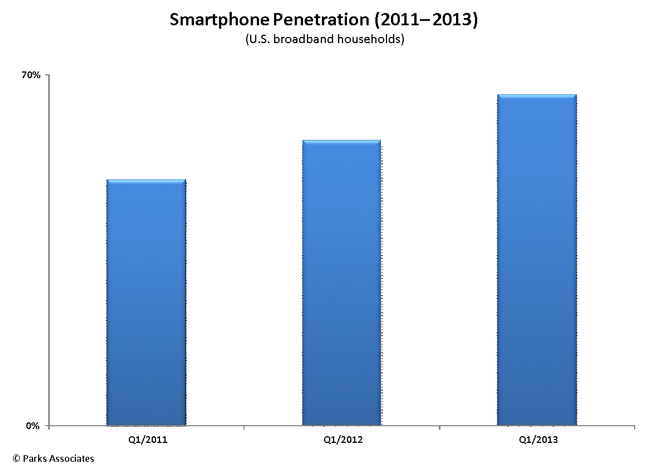 Over 100 million households will have broadband by the end of 2013. The presence of these reliable, always-on connections is fundamental to healthcare solutions. The U.S. has reached a point where households can expect access to broadband connections in almost all regions of the country – and these connections are influencing their purchase habits and activities. 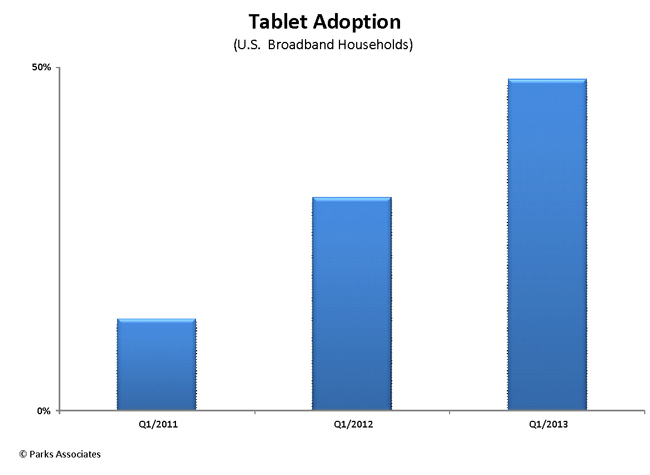 By the first quarter of the 2013, two-thirds of U.S. broadband households had a smartphone, and nearly 50% had a tablet. These mobile devices have reached mass-market appeal, and through apps and wireless connections, consumers are using them for a variety of cross-category purposes – from second-screen video experiences to home monitoring. Both consumers and medical professionals have shown increasing interest in health apps as well. Thousands of smartphone and tablet apps are now available to help consumers live a healthier lifestyle, better manage chronic conditions, and coordinate caretaking activities, among many other use cases. Nearly 20% of smartphone and tablet owners use an app to track or manage their fitness activities. Doctors and nurses can use medical apps to access reference material, gain diagnostic support, view patients’ electronic medical records and lab results, and even host video conferences with colleagues or patients. In many ways, these devices represent built-in assets that operators can leverage to add value to their service offerings. Broadband and mobile service providers assume multiple roles in this value chain. They are first and foremost providers of the network upon which independent living and health monitoring services are built and offered. They also act as system integrators when working with specific solution vendors and as marketing channels when solution providers leverage their business connections with large healthcare systems and insurers. There are also ongoing market changes which would bring service providers into direct, one-to-one relationships with healthcare customers. Home health monitoring devices have traditionally been stand-alone devices with no Internet connectivity; patients or their healthcare providers had to extract collected data manually, if at all. But new products and services have network connectivity capabilities, which extend their utility and create new scenarios for data aggregation and analytics. These new solutions invite new types of partners into the healthcare system. Broadband and wireless service providers are now directly involved in delivering care remotely to patients. Additionally, mobile service providers are already supporting millions of devices and services, namely smartphones and tablets, which consumers are using on their own initiative to monitor their health. Two-thirds of U.S. broadband households used an online health service over the past 12 months to maintain their health or help manage an illness. One of the key value propositions from connected health solutions is that they support at-home self-care that has become more economically and technologically viable. Home care and self-care are two cornerstones of the healthcare system strategy to shift care delivery from high-cost inâ€patient care settings (e.g., hospitals) to less-expensive, outâ€patient (e.g., physician offices) and home care environments. Contemporary health application developers and service providers rely on broadband or mobile network connectivity for the success of their next-generation products and services, which are designed to improve patient engagement, lower operating costs, and increase revenue opportunities. As a result, connected home health solutions—either for realâ€time communication or via storeâ€and-forward technologies—have experienced steady gains over the last decade, both in real dollar terms and in mind share among consumers and care providers. 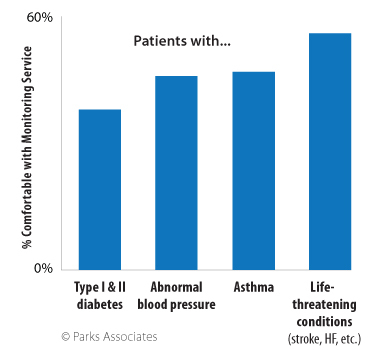 Consumers with chronic conditions are also becoming much more comfortable with concept of home healthcare monitoring services. Connected home health solutions are, however, far from reaching their full market potential due to outdated regulations, resistance to change, and slow payment reforms. On the positive side, the transformation of home care by technology is in progress. From POTSâ€based analog solutions to IPâ€based broadband/mobileâ€enabled solutions, home health monitoring as a business segment has attracted new types of solution developers, service aggregators, and distributors. Broadband/wireless service providers have joined drug companies, consumer electronics retailers, and even home builders and installers, to support deployment of connected health products and services. Broadband/telecom service providers have been eyeing the connected health market for more than five years. Early trials, such as Sasktel’s LifeStat service, Orange France’s GPS tracking service enabled by Medical Intelligence, and Comcast’s home monitoring service using BL Healthcare’s solution, fared poorly with end users. These highâ€profile failures highlight the challenges faced by broadband service providers due to a lack of brand power, consumer trust, and established expertise in distributing healthâ€related devices and services. However, disappointment with service uptake in the consumer market has not deterred service providers from nurturing the connected health market. In developed countries, broadband service providers lately have been playing more of an integrator role enabling service delivery than directly selling services to consumers. This approach, although offering smaller and less immediate revenue opportunities, reduces service providers’ business risks, helps them gain expertise, and enables them to build broad partnerships with health monitoring technology providers and healthcare service providers along the way. From an application perspective, broadband service providers’ interest crosses all major service categories, with a strong focus on chronic disease management and senior independent living services. In these two areas, they actively pursue partnerships with solution providers, platform enablers, and service renderers. In other areas, such as GPS location tracking, medication monitoring, and chronic condition diagnostics, they are currently content as a backend infrastructure service provider, collecting revenues from their partners for use of their network. For instance, AT&T and its partner WellDoc started to offer the DiabetesManager® application to commercial health plans in 2010. DiabetesManager®, developed by WellDoc and hosted on AT&T’s network, is a mobile selfâ€care solution analyzing diabetic patients’ vitals and dietary information and then providing feedback to patients and their healthcare providers to encourage positive behavioral changes. AT&T is also working on a prototype fall detection device called Smart Slippers: wireless sensors built inside a pair of slippers can capture velocity in acceleration and measure changes of insole pressure. Both types of data will be processed through computer algorithms to predict a fall event and activate the alert system. 1. Direct Competitor: In this model, broadband/mobile service providers launch a service of their own targeting consumers or business customers directly. The upside is that service providers own the entire revenue stream from whomever pays for the service, but the potential risk is that service providers have to deal with the many components of the service. They may lack the experience to do so expeditiously. Other risks include their lack of brand recognition/trust among users for health related services and the chance that their existing partners may revolt due to their direct competition. 2. Service Partner: This model allows broadband/mobile service providers to act as partners for service provisioning, marketing, and support as well as coâ€branding activities. In this model, service providers are likely to play only a minor role in service delivery and therefore would be entitled to a small, perhaps fixed fee based on partnership terms and a revenue-sharing agreement. 3. Service Wholesaler: This model further relegates broadband/mobile service providers to the assistive role. Instead of directly participating in the service delivery, they sell voice, text messages, or data in bulk rates and let buyers of the wholesale service launch connected health services. 4. Service Reseller: As the name implies, this model makes broadband/mobile service providers a reseller or channel partner. They earn a reseller fee through service markâ€ups or based on pre-agreed rates for use of their channels. 5. M2M Integrator: This model keeps broadband/mobile service providers further away from service delivery—they interact with IPâ€based device or module makers to negotiate a rate for embedding network connectivity. In most cases, mobile 2G/3G resides in the device or gateway. The rate can be a lump sum or can be based on a perâ€device, per month rate for the estimated life of the device. Usually this model renders the lowest revenue per end user for broadband/mobile service providers as it places them further upstream in the value chain. Based on Parks Associates’ assessment, broadband/mobile service providers should try the M2M integrator model at a minimum. The emergence of machine-to-machine (M2M) connectivity in the consumer health market, while still in its early stages, represents a significant opportunity. A growing number of health-related devices and applications require reliable and always-on network connectivity, making M2M a natural fit in the healthcare industries. AT&T and Vodafone support mobile health monitoring devices that track patients’ heart health and other related vital signs for Boston Scientific. T-Mobile, through customer BeClose, supports connected body and home sensors that track a senior’s in-home activity, detect accidental falls, and improve the overall aging-in-place experience. Orange and Sprint support vital-sign monitoring devices for IDEAL LIFE that can track and help manage chronic conditions such as diabetes and congested heart failure. Sprint, through BodyMedia, supports connected fitness devices that collect and track fitness progress toward consumers' established goals. AT&T, through its customer Vitality, offers a connected pill box that tracks medication usage, offers reminders, and requests prescription refills. Telenor supports a wireless glucose meter, offered through Telcare, that integrates with clinical servers, electronic health records, and multiple smartphone apps for diabetes management. Capitalizing on the M2M opportunity in the consumer health market, especially for new market entrants, requires patience and focus. Operators need to establish relationships with device makers as well as with emerging players that are disrupting the traditional medical device market. New players such as CardioNet (arrhythmia monitoring), Dexcom (continuous glucose meter and monitoring), Vitality (connected pill box), IDEAL LIFE (networked vital sign monitoring), and LogicMark (mobile PERS) are challenging established market leaders—brands like Philips, Medtronic, Omron, and Linear. Service providers improve their revenue opportunities by moving closer to the consumer. To capture these revenues, they must look for business models that place them further down the value chain—the closer they are to end users and business customers, the higher the revenue potential. However, they also increase their exposure in a market with high privacy expectations and time-sensitive demands. It also leaves them vulnerable to potential failures to convert business opportunities in this industry into sustainable revenue streams. There are different business models in the connected health area that fit better or worse for broadband/mobile service providers. The business models indicated in this table are feasible choices for broadband/mobile service providers, and the accompanying high/medium/low labels indicate the probability, based on Parks Associates' assessments, that most service providers will adopt such a model within the next five-year period. Why is providing connected health solutions important to regional operators? Although development of connected health solutions is spearheaded by tier-one telcos around the world, tier-two and regional operators still have plenty of opportunities. Tier-one operators have the advantages of a national infrastructure and large customer footprint, but the healthcare service industry is fragmented, with localized service delivery. Regional operators can still compete effectively with national operators in local/regional markets if they launch the right solutions with the right partners. In these instances, regional operators might even have an advantage through their connections to community leaders and local health organizations within a target market. From a growth strategy perspective, the healthcare industry also represents a long-term opportunity for regional operators. The healthcare institutions are investing to upgrade their IT infrastructure, and the federal government also encourages telemedicine deployment in rural areas through special grants and federal funding. To build a sustainable healthcare service business model on top of the IT infrastructure investment, these healthcare institutions need strong partners helping them from service provisioning and integration to application development and management. These needs will generate new revenue opportunities for regional telcos if they position themselves as trusted partners for the healthcare industry. Telecommunications service providers with voice, broadband, and mobile services have shown strong interest in connected health products and services. For now, they are refraining from direct engagement with end users on connected health services and instead are focusing on building broad alliances with all kinds of health application and solution providers. As the connected health market evolves, service providers will leverage their managed service platforms and application partnerships to capture revenue streams from whatever business models their customers prefer. Parks Associates believes the healthcare industry, and the connected health market in particular, represents a long-term market opportunity for national and regional telcos alike – and many of these providers will soon be developing health-based services that will bring them very close to healthcare customers.